IBASE Technology has announced its latest EN50155 certified fanless rolling stock system powered by a 2.6GHz 6th Generation Intel® Core™ i7-6600U processor. 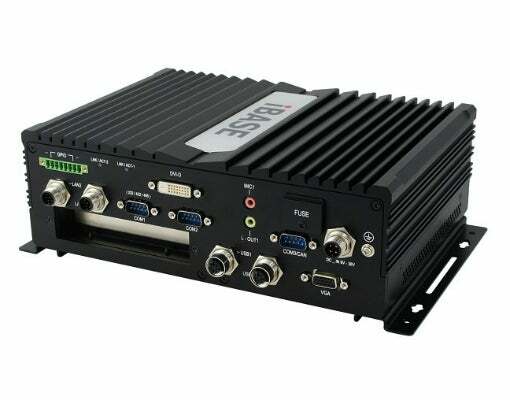 Purposely built for various rolling stock applications such as train control and management, passenger information, entertainment and communications, and surveillance, the rugged MPT-7000R computing solution provides an optimal combination of high performance with low power consumption. It is equipped with ruggedised, lockable M12 connectors for firm I/O connections during travel and silently operates at temperatures from -20°C to +55°C. This system has undergone a number of tests to follow EN50155 standards and protect against shocks, vibration, humidity, temperature variations and excessive voltages. The MPT-7000R is available in two models, 24VDC input (MPT-7000R) and 72/110VDC input (MPT-7000RHV). The M12 Gigabit Ethernet, two USB 2.0 and power input connectors are on the rear, as well as a PCI-E (x4) socket. For easy access and maintenance, the front panel comes with a CFAST socket, a 2.5" drive bay, two SIM sockets, two USB 3.0 and four antenna connections.